At midday on Tuesday the centre of Cyclone Pam was located about 280km northeast of the Chatham Islands, with a central pressure of 945hPa. At 9pm Tropical Cyclone “Pam”, a Category 3 Cyclone, is lying near 32.8S 178.5E, or about 500km east-northeast of Cape Reinga moving swiftly southeast at 55 km/h. We are expecting “Pam” to recurve a little southward before passing about 150km east of East Cape at midday tomorrow. The forecasting team continue to monitor the progression of Tropical Cyclone Pam. By comparing the forecast tracks of several models the team have compiled a best track forecast for the position of the centre of the system as it tracks southwards. 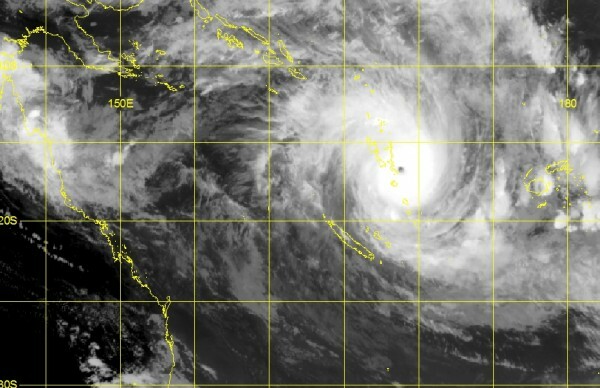 The latest guidance and advice from the Fiji Meteorological Service has upgraded Tropical Cyclone Pam to a category 2. This means that sustained wind speeds close to the centre of the system are in excess of 90km/h. The system is forecast to continue strengthening as it moves slowly to the southeast. At 1pm, New Zealand time, TC Pam was located at 9.7°S 170.4°E, with a central pressure of 985hPa. The latest track and position information can be found on the Fiji Met Service website.